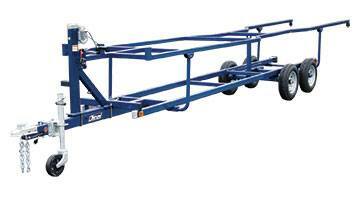 Our E-series trailers are designed with the highest quality materials to ensure you have the best possible pontoon hauling experience. With features like a double-pulley winch lift system and heavy-duty steel tube construction, you can be sure your pontoon will be easy to load and safely secured. Take a look at some additional features below, and be sure to request a quote from your dealer when you find the model you’re looking for.